We have hand picked the best selling and most popular products by industry ranging from Comic Book Shops to Artisanal & Gourmet Food Stores. Looking for store fixtures and displays that meet the needs of commercial, professional, or retail establishments without breaking the budget? StoreFixture.com offers a huge selection of business furniture, equipment, and merchandising accessories for sale that are designed specifically for high volume, public use. 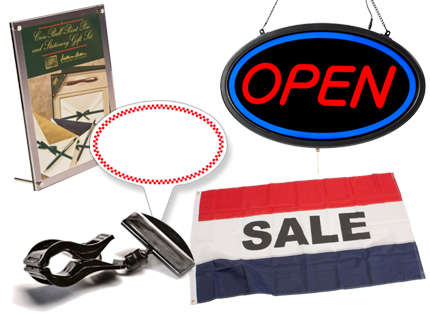 Our top quality store fixtures and displays run the gamut from outdoor signage to interior merchandising, gallery advertising, cash and customer service counters, modular freestanding fixtures, mannequins, glass cabinets, and simple peghooks, hangers, and pricing clips. Bulk purchasing from our suppliers around the world and our massive warehousing facility allow us to offer fast shipping and wholesale pricing on every order, no matter the quantity. In fact, the majority of our our commercial grade store fixtures and displays, also known as retail merchandising accessories and furniture, will ship same day when ordered before before 3PM EST (US). What types of retail merchandising accessories are available for sale online at StoreFixture.com? 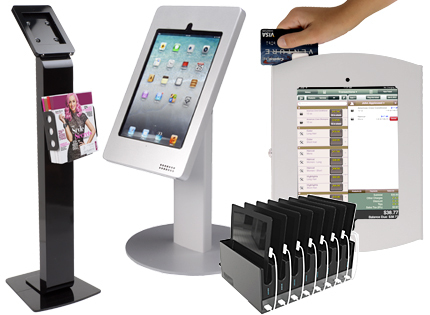 Cash stands and customer service counters are frequently the most necessary store fixtures and displays in any establishment. These fixtures provide secure storage as well as functional employee workspace as needed. 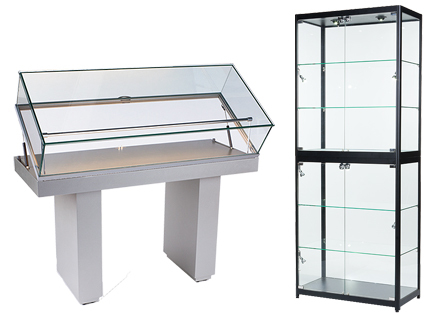 Merchandise display cases are available in a variety of styles can can be used as single features or combined into highly functional cash wrap configurations. Retail tables and merchandise shelving help keep changing inventory organized without impeding either visibility or accessibility. A huge variety, including 1000s of styles, sizes, finishes, and configurations, is available to match any decor. Standard fixtures can be easily augmented by adding feature, endcap, or point of sale elements to highlight specialty items, sale merchandise, or new product lines. 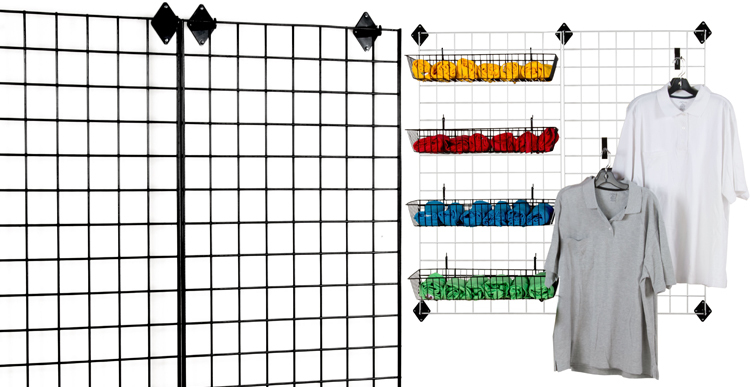 Display racks and merchandising risers are designed to create maximum visibility in commercial stores, at trade shows or other promotional events. Small product advertising stand combines economy with versatility, as the small sizes allow risers to be used singly or together as feature, and are easily moved as needed. Countertop and freestanding floor racks not only showcase merchandise, but can help create customer traffic flow patterns for maximum engagement. 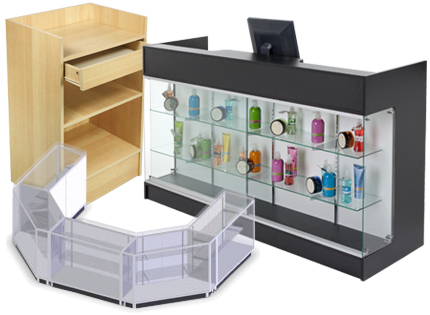 Modular merchandise display fixtures are available in multiple styles. 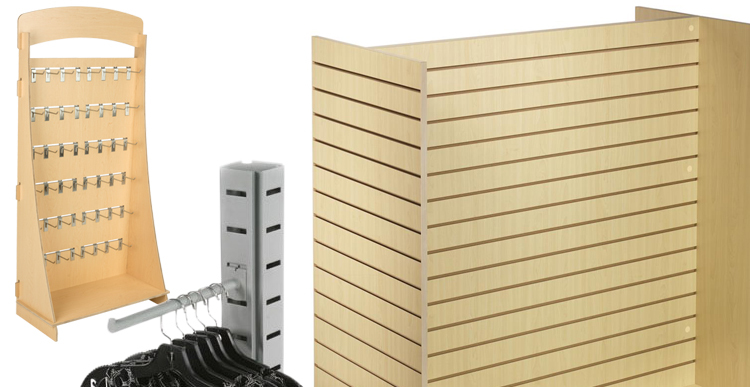 Gridwall, slatwall, and pegboard bases and backers are available as wall-mounted panels, freestanding kiosks and gondolas, and countertop displays as well as in single and double-sided perimeter merchandising units. 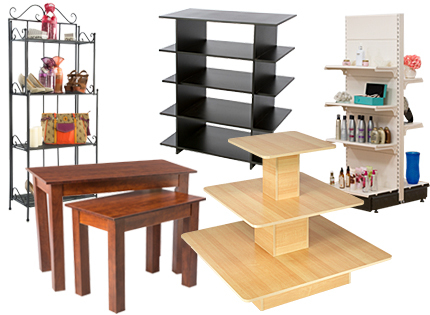 A huge variety of accessories allows these versatile retail and commercial display furniture pieces to accommodate single and bulk product merchandise, signage, hangers, hooks, or specialty items. 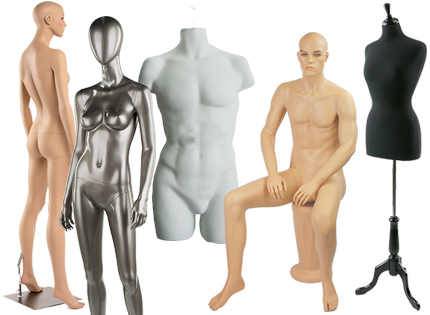 Mannequins are some of the most versatile display fixtures in any environment and not merely clothing stores. Available in a range of sizes, age range representations, body configurations, finishes and styles, these body forms not only showcase clothes and accessories, but can also help visually represent the style of an establishment to customers. 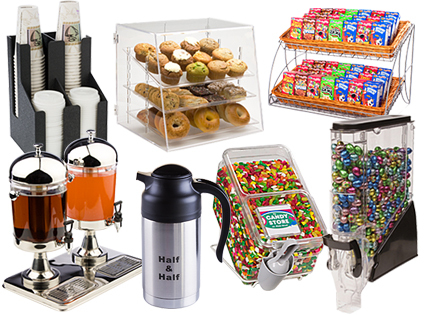 Food merchandising bins, racks and stands easily function as specialty displays in hospitality environments or as general merchandising displays in commercial and other retail estabilshments. A wide variety of styles allow these feature fixtures to accommodaste many different purposes, from bulk storage to high visibility displays guaranteed to attract attention in any environment. iPad holders, stands and accessories are some of the most versatile business or store supplies available. These interactive advertising and presentation fixtures and displays serve many different purposes in commercial, retail, and corporate environments. From wayfinding and informational displays to check-in, check-out, and payment kiosks, tablet holding fixtures for commercial environments can be found in almost any industry. Manufacturing, corporate, and educational establishments fnd these iPad display stands and kiosks as useful as retail stores and professional businesses. 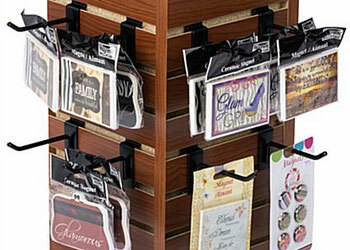 Signage holders are indispensable to any business. From high visibility stands designed for outdoor use to simple pricing display clips to poster and wayfinding sign holders, these wall frames, frameless glass signholders, and freestanding poster stands with built-in brochure displays for advertising materials help businesses attract customer and patron attention in high traffic areas. Digital signage stands feature large format flat panel screens for featuring video advertisements. Create dynamic ads that will entice passersby in malls, shops, and event venues. Each electronic signage display has a slim, sleek design that doesn't distract from the message you're playing. Our flat screen stands have a plug-and-play design that makes adding and playing your content a breeze. 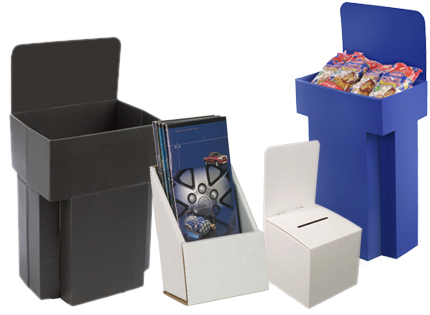 Bulk dump bins and cardboard display fixtures offer high visibility storage for large volumes of items. When placed in high traffic areas such as entryways or at point of purchase, these stands, bins, and racks are proven choices that encourage customers to interact with merchandise. In addition, the various styles available help businesses match or in come cases create decor themes and brand imaging. 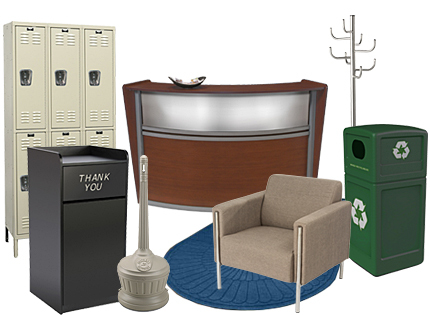 Facilities management supplies, furniture, and accessories span a wide range of categories. From durable furniture and rugs designed for high traffic public entrances to device-specific charging stations for iPads and Android tablets and pre-printed artwork, these operational accessories serve to add customer comfort and benefit to any establishment. In addition, racks and stands and carts or trolleys help businesses operate smoothly and efficiently, no matter what their industry or location. Store flow — creating a physical journey for customers, and not simply directing patrons toward particular merchandise — is something to keep in mind when designing commercial layouts. 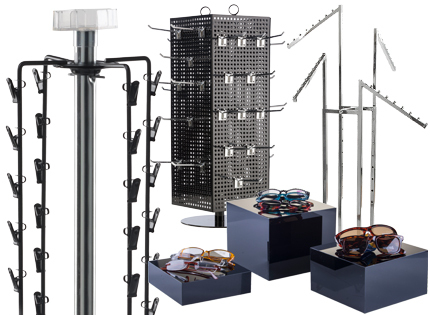 Placing shelving and racks strategically throughout a sales floor, office, or showroom creates flow and guides visitors customers effortlessly through merchandise. Retail environments with good, organic flow draw customers into the business, and lead them through it from one department to another, as part of an engaged journey. One way to create a flow in your location is by utilizing retail counters, display cases, and racks to direct client traffic. Display case configurations not only encourage your customers to see what you have on display, but when placed strategically, they can also increase in-store engagement by attracting customers to visit additional departments, as well as creating consistent imaging throughout the establishment. It is also easy, and cost effective, to use POP displays such as end caps, dump bins, and signage displays to create focal points within stores and commercial environments to generate or increase interest and engagement. Whether selling expensive jewelry, high-end leather hand bags, or designer perfume, the showcases, stands, and accessories featured on this site are perfect for a wide variety of commercial venues as well as retail environments. Our huge selection easily accommodates the wide range of display needs between professional service establishments and retailer merchandising, as well as those of educational or manufacturing environments. In addition, we offer custom-curated specialty marketing tips and ideas, from holiday store merchandising to special event marketing design, as well as industry-specific recommendations intended to help businesses make creative choices that will help build recognition, improve customer satisfaction, and ultimately, increase revenue. Looking for more information? Browse descriptions of all of our product lines and web shopping pages on our site directory.